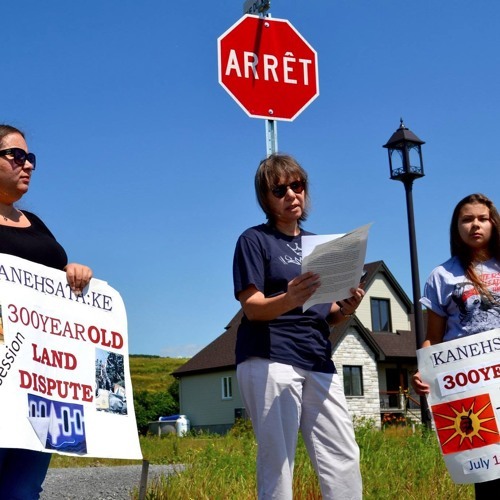 This month's LegalEase took on an indigenous focus featuring a live recording of a rally led by John Cree and Katsitsakwas/Ellen Gabriel resisting a housing development project next to the sacred pines area on Kanienkehaka territory, the same area they protected in the 1990 78-day armed standoff known as the “Oka Crisis.” Next we interview a Mi'kmaq water protector participating in an ongoing demonstration against Alton Gas's plan to store high pressure natural gas in salt caverns that will divert 10 million litres of mining waste per day into the Shubenacadie River. Next we feature stories from the podcasts Media Indigena and From the Margins. The first is a discussion with Mi'kmaq Professor Pam Palmater on the Canadian colonial tactic of imposing third party management on first nations. The second piece ("Workers Go to Jail While Bosses Pass Go") explores how class structure is reinforced through the application of workplace theft law in Canada.